How many Twitter users in Sweden 2013? Almost half a million Swedish Twitter accounts is the quick answer. Twitter in Sweden has seen an strong period of growth during the past year. Hampus Brynolf and Intellecta Corporate have released the results of their third Swedish Twitter census. The number of Twitter accounts that at some point during a 30 day period in February/March 2013 tweeted in Swedish was 475,474. This is an increase of 59% in the 10-11 months since Intellecta presented the 2012 results. For each potential Swede found, the words from their latest 100 tweets are analised. If enough words are Swedish, then they are classed as Swedish and their follows/followers analyised. In April last year there were 290,000 Swedish accounts. The first Swedish Twittercensus In December 2010 found just over 90,000 accounts. This year’s growth rate of 59% is tiny in comparison to the growth by approximately 300% during 2011. Not all of the 460,000 accounts are active. Quite the opposite. Around half of these accounts haven’t written a single Tweet during the month that was analysed. A number of those accounts, although not actively writing, will be actively reading – but this is impossible to calculate. This total also excludes protected accounts as it’s not possible to analyse the language of their private tweets. The number of very active Swedes – where one or more tweet is written (on average) during the 30 day period – also rose. Up from 52,887 to 79,516. A rise of around 50%. It would be interesting to see how many of those 50,000 who were tweeting daily in 2012 were still tweeting daily in 2013. Many of them will be, but far from all. The number of active Swedes – that is those who wrote a tweet during the 30 days of the census – was 219,732. Twitter is no longer a niche network occupied by early adopters. It is now broadly established in Sweden. Analysis of the bios associated with the accounts shows a rich diversity of occupations, people, and interests on Twitter. A fascinating fact thrown out by Hampus during the presentation was that the number of degrees of separation between Swedish Twitter users was usually 2 (sometimes 3). Although everyone is relatively close on Twitter, the clusters found were very strong and certain clusters were very separated from others. There isn’t one Twitter, there are many. 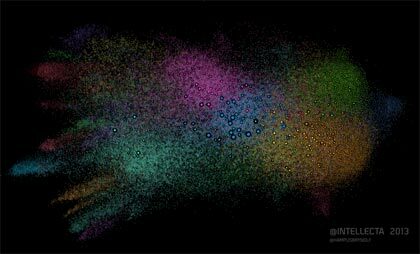 An interactive visualisation of all the Swedish Twitter accounts found and their clustering according to analysis of their bio can be found here. The previous Twitter census was performed directly after a significant peak in number of new registrations. It was always going to be very difficult for the growth levels this year to match last year. That said, with there being a Twitter account for every 1 in 20 Swedes and the rich diversity of people present on the platform, Twitter has established itself quite definitely In Sweden as a communication, broadcast and social platform. James Royal-Lawson+ is a freelance digital strategist based in Stockholm Sweden.